A gathering was held in Hanoi on May 23 to celebrate the 68th anniversary of the Vietnam–Russia Friendship Association (May 23, 1950) and to recall great memories in the history of the Vietnam–Russia friendship. The event was hosted by the Vietnam–Russia Friendship Parliamentarians’ Group and the Central Vietnam–Russia Friendship Association, allowing the two organisations to share experience in foreign affairs work. In his opening remarks, President of the Vietnam–Russia Friendship Parliamentarians’ Group Phan Xuan Dung said Vietnam and Russia have focused on maintaining and developing ties between the two national assemblies. The two sides have exchanged visits to share practical experience in performing the legislatures’ functions, monitor the implementation of bilateral agreements signed by the two governments and improve the legal environment to facilitate cooperation between the two countries’ localities and businesses and increase understanding between their peoples, Dung noted. He expected the two nations will further foster their parliamentary and people-to-people diplomacy and promote coordination between the Vietnam–Russia and Vietnam–Russia parliamentarians’ groups. 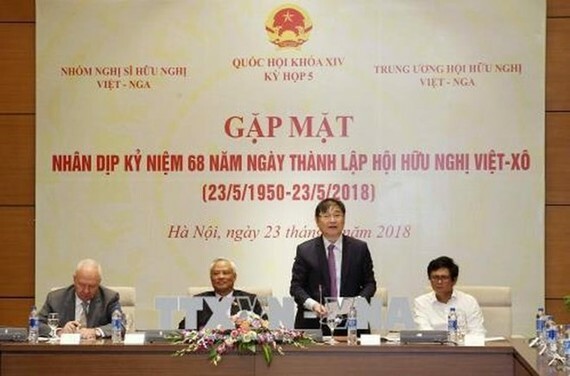 President of the Vietnam-Russia Friendship Association Tran Binh Minh, for his part, mentioned the association as one of the most active friendship associations in Vietnam because of its large number of members and the strong bonds between them. Minh said he hopes that activities of the Vietnam–Russia Friendship Association and the Vietnam-Russia Friendship Parliamentarians’ Group will play a significant part in expanding the two countries’ relations and developing people-to-people diplomacy. Russian Ambassador to Vietnam Konstantin Vkunov lauded the growth of Vietnam–Russia relations, saying he expects ties to be strengthened through exchanges of high-level visits and friendship activities between the two sides. Vice Chairman of the National Assembly of Vietnam Uong Chu Luu congratulated Russia on the reelection of President Vladimir Putin. He also looked forward to more activities by the Vietnam–Russia Friendship Parliamentarians’ Group and Vietnam–Russia Friendship Association to promote bilateral relations.